Our Lavender Tea Tree “all natural deodorant” is a great compliment to our Lavender line of products. The clean herbaceous fragrance of Lavender essential oil is tranquil and soothing. 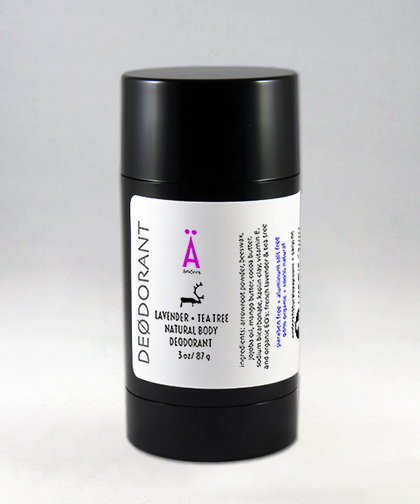 Antioxidant and antiseptic properties compliment this top selling deodorant. The famously medicinal properties of Tea Tree effectively eliminate bacteria and prevent the spread of odor while soothing sensitive skin. Antiviral and skin-healing qualities round out this great deodorant. Tea Tree essential oil is steam distilled from the leaves of the Tea Tree plant, also known as Melaleuca alternifolia. This oil is known for its antimicrobial properties. Tea Tree is naturally astringent and is excellent for acne prone skin. Tea Tree effectively prevents the spread of odor while it soothes sensitive skin.